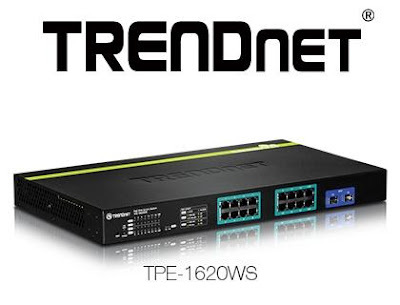 TRENDnet TPE 1620WS 16-Port Gigabit web clever PoE+ switch - change - managed - 16 x 10/one hundred/1000 (PoE+) + 2 x shared Gigabit SFP - laptop, rack-mountable - PoE+. TRENDnet's sixteen-Port Gigabit net intelligent PoE+ swap, model TPE-1620WS, gives you a 32 Gbps switching capacity with 16 PoE+ Gigabit ports and two shared SFP slots. This IPv6 equipped switch presents advanced site visitors management, troubleshooting, safety, vigour saving GREENnet, and monitoring features at a diminished price.